I tend to fall in love with certain wines every few months, but I think this one will last. I have gone through a Cotes du Rhone period before but never found as many great, great wines as I have recently. The beautiful thing about these grenache-based wines is even with one dominant grape they can still be very different. 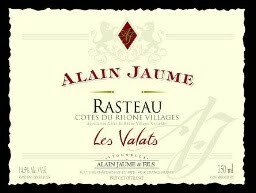 Wednesday night I shared a bottle of Alain Jaume 2007 Rasteau Cotes du Rhone Villages. We had it with some crackers and a couple of different cheeses. It was just awesome red wine for good conversation, good cheese, and easy drinking. Do you dare disagree when the other guy is buying the wine? It’s aged in stainless steel so it has that uber-smooth texture that is great to sip with a log on the fire! The point is it has big fruit and incredible balance. I liked this wine a lot. It comes from a prestigious producer in the southern Rhone area. This is a classic $14.95 wine that could easily fool you to think it was more like $25.